Characteristic balcony of Ragusa Ibla with under a statue that seems to hold up it. Sicily. Italy. Characteristic balcony of Sicily. Statue of the Telamone. Sicilian building. Antique sicilian house. 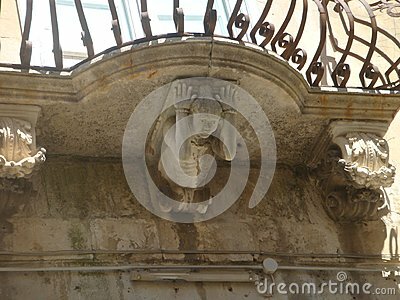 Antique sicilian balcony. Balcony of Ragusa Ibla. Travel destination. Sunny day. Balcony in wrought iron. Statue of a moor. Bust and head of a moor. Statue that seems to lift the balcony. Old building. Sicily Italy. The Telamone frowning forehead for the big effort, Statue under the balcony. Summertime. Statue of a man. Statue with the lifted arms. Man under the balcony. Art of stonemasons teachers. Balcony that tells a history.